Kempston Rovers and AFC Rushden & Diamonds have agreed to a deal which will see The Diamonds using Hillgrounds for their home matches in 2017/18. The agreement gives Diamonds the requisite security of tenure at a ground which is appropriate to the club’s position in the National League system and will provide a temporary home for the team while Rushden & Higham United’s Hayden Road base is brought up to the required ground-grading standard. Diamonds’ chairman Ralph Burditt said: “Signing this agreement gives our club the stability which it needs to move forwards following a challenging period of time. “From our first contact with them, Kempston Rovers have been extremely friendly, accommodating and professional and I am thoroughly looking forward to continuing to work with them. Rovers’ chairman Russell Shreeves said: “We’re very pleased to have signed this agreement with AFC Rushden & Diamonds and look forward to welcoming them and their supporters to our ground for the forthcoming season. One possible implication of this new deal will be that the Rovers’ development team will have limited access to the grass pitch. 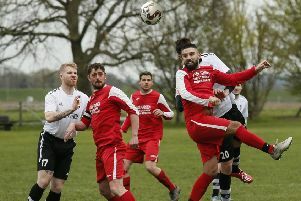 The Kempston committee will be discussing their pitch options with the Beds County League with the intention of keeping the development team at the highest possible level. Any financial benefits for Rovers from the deal have not been disclosed.